POND CLEAN-OUTS: Man-made, "maintenance free" ponds are hard to find. Don't let your contractor fool you, all ponds need proper, routine pond maintenance. In fact, backyard ponds can be a lot of work. Trying to clean your own pond can be extremely messy, time consuming, and, if your are an inexperienced fish handler, your could endanger the health of your prize koi. Leave the pond cleaning to us. We can restore any pond ecosystem back into the healthy, beautiful pond ecosystem it once was. Each ecosytem is different and our service depends on the needs of your pond and your pond expectations. Call SDPS for pricing or to schedule a consultation to assess your pond's needs and to configure your custom rate. Pond owners and koi hobbyists know how quickly a beautiful koi pond or water garden can turn into a ugly, dirty, overgrown algae swamp. 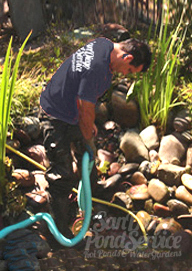 San Diego Pond Service offers pond clean-outs for all types of neglected or dirty koi fish ponds. Large or small, liner ponds or concrete ponds, we are equipped for the job. CLEAN-OUT SERVICES: Pond "clean-out" services include; a complete pond draining, temporary koi fish housing, pond powerwashing, 100% sludge removal, plant care, water conditioning, filter cleaning, leaf trap and basket cleaning, pond surface skimming, and a bacterial dosage to jumpstart your new pond ecosystem. 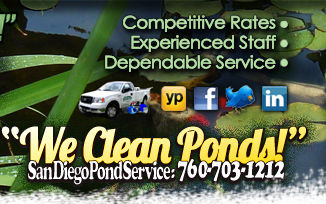 We recommend a good pond 'clean-out" about once a year, pending pond condition.